Google's Chrome OS continues to show up one more devices, and today's it's marking another notch on the desktop category with the new Asus Chromebox. 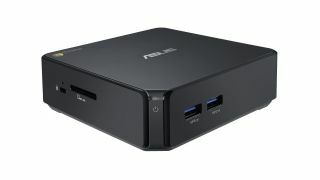 The most compact Chromebox yet, Asus revealed a new mini-desktop measuring a scant 4.88 x 4.88 x 1.65 inches. The small, fanless unit comes packed with an Intel 1.4GHz dual-core Celeron 2955U Haswell processor in the base model. As an Intel-powered box, it comes with integrated graphics, plus 2GB of RAM, 16GB of solid-state storage, dual-band 802.11n Wi-Fi with Bluetooth 4.0, an SD card reader for media and expandable storage. For a little more power customers can bump up the specs to a 1.7GHz Core i3-4010U and 4GB of RAM. Asus' Chromebox will also come in a 2.1GHz Core i7-4600U powered variety but this model won't be available on US shores. The three boxes come with four zippy USB 3.0 ports, Ethernet and HDMI and DisplayPort out for dual-monitor setups. Asus also claims that the Intel i3 and i7 powered units will be able to support Ultra HD 4K TVs. The Asus Chromebox joins the likes of other cloud platform Chrome desktops including the ill-liked Samsung Chromebox and recently debuted LG Chromebase. But with a $179 (about £109/AUS $200) starting price, the Asus Chromebook is already looking much more affordable than Samsung's model - and even more than the similarly outfitted Intel NUC. You'll be able to can snag your own Asus Chromebox in March. Are traditional PC operating systems more your speed? Then you might be happy to know Windows 8.1 is not completely terrible in our review.